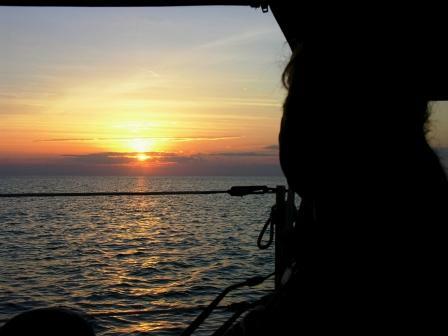 Sunset over Marathon as we're anchored in Vaca Key Bight. 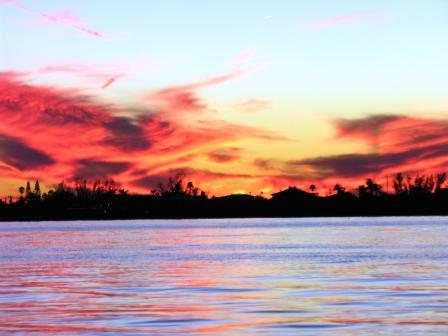 New Year's Eve Candy Canes on the Water. 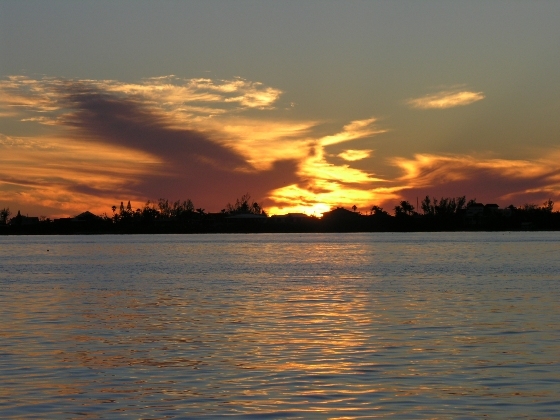 As you head south from outside Boot Key Harbor, you'll make way around the tip of land to see this house on its own island. Make sure you stay well clear of the tip of land as it can get rather shallow as you round the house to head east toward Vaca Key Bight. This is a great staging area for crossing over to the Bahamas. 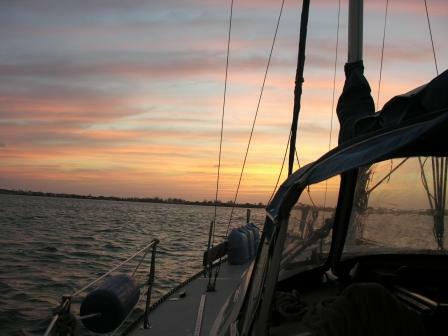 However, many or even most don't like to anchor here as it can be a very rolling anchorage. We have a secret to how we keep September Sea stable and not rolling while anchored in contrary waves. 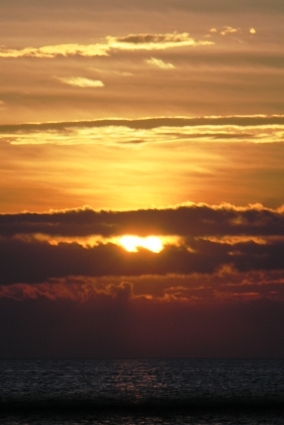 Many a time we've seen others rolling all day and all night long while we're pointed in the direction of the waves instead of having our beam to them. It's always better to have your bow to the waves as a boat will be a lot more comfortable going up and down instead of rolling side to side. I'll tell you, below, how to accomplish this marvelous trick of staying bow to the waves. 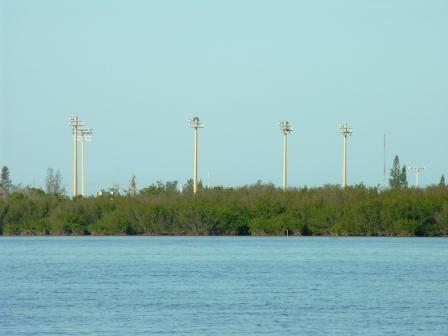 The lights of the Marathon High School football field. Going down here to anchor in front of the mangroves, past the houses, gives you more privacy and you don't feel like you're imposing on those who live ashore. 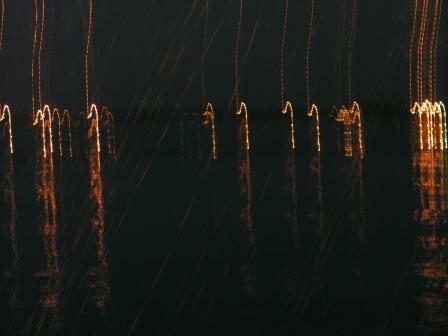 You can see the lights to the left, we're past the lights and snug in our anchorage in front of the mangroves. 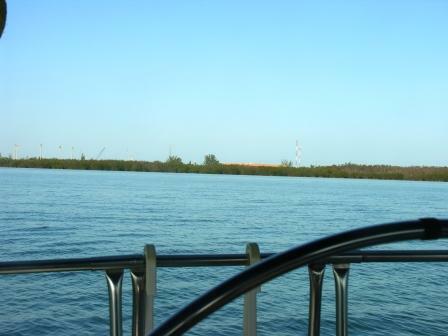 There is a channel to the right of the mangroves, so don't anchor too near there. If you do, you are guaranteed to have many wakes from fishing boats coming out of the channel revving up to get out to open water. Here's the channel. Give the boats coming in and out of the channel plenty of room to go way around you so you won't be bothered by wakes from their boat. They'll appreciate your consideration. 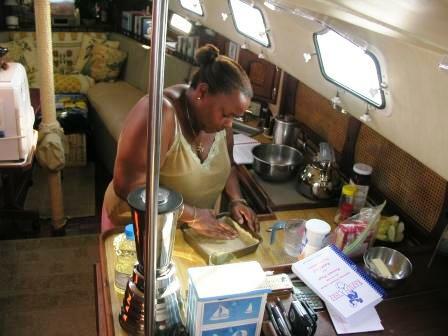 No More Rolling while at Anchor! Usually, if you have enough wind, a boat will point into the wind. But if the current is more powerful than the wind, you'll find this technique invaluable for comfort, as it eliminates rolling. Adding a spring line attached to the anchor rode and the other end attached to the stern (position explained later) allows you to alter the boat's position by swinging the stern, so the bow will point into the waves and gently pitch the boat up and down at the bow (front), much more comfortable than rolling. 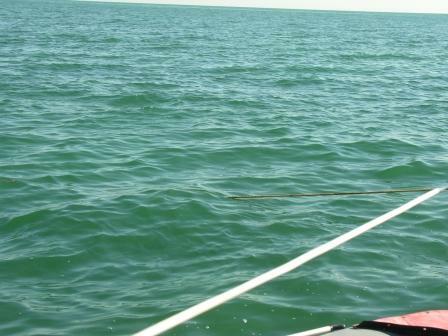 To keep your boat facing the waves instead of moving with the current (which often moves a boat so waves are hitting you on the side [the beam] instead of on the front [the bow]), we use a technique called "Springing the Rode." The way this works is you take a line equivalent to the length of your boat and tie one end to the anchor rode at the bow of the boat, using a rolling hitch. Whichever direction you want your bow to point, run the spring line outside all stanchions and hardware on the opposite side. For example, if you want your boat to swing to starboard, you'll attach the other end of the spring line to the port stern cleat, again: keeping the spring line completely outside the life lines and stanchions. To point to port, run the spring line outside the starboard side. Now you'll be able to manipulate the position of your boat by letting out more anchor rode. Let out as much as is needed to move the boat into the comfortable position you desire. Give it some time as you let out maybe ten feet or so at a time until you get a feel for how much that amount moves the position of your boat. You can also tweak your positioning by hauling in some of the springline. Make adjustments until you are where you want to be and there's relatively equal pull on both the anchor rode and the springline. The technique will keep your boat from rolling as when you face the waves, as you'll feel a gentle up and down motion rather than a rolling motion. I've never had a problem with the anchor pulling out when using this technique. Perhaps it is because the anchor is basically still being pulled from where you set it, you've just have added the springline and kept equal pull between it and the anchor rode. Above: Anchor rode shown perpendicular to boat after spring line put in place at BOW (on anchor rode) and then the springline taken outside all hardware and tied to the boat's STERN. By letting out more anchor rode you can change the boat's position. Above, you can see the anchor line going out on the port side. 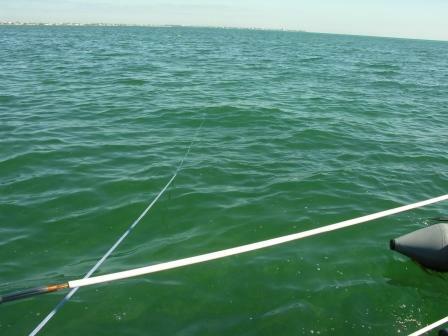 The boat's length runs perpendicular to both anchor rode and spring lines in these photos to illustrate how you can easily position your boat no matter what the current or wave action may be. The pull on the originally set anchor is actually no more than it was before if you keep the pull relatively equal on both the anchor rode and the springline. You can tweak your position by hauling in on the springline or letting more anchor rode out, or both! Above: Spring line on stern cleat (other end of springline has been attached to the anchor rode at the bow). 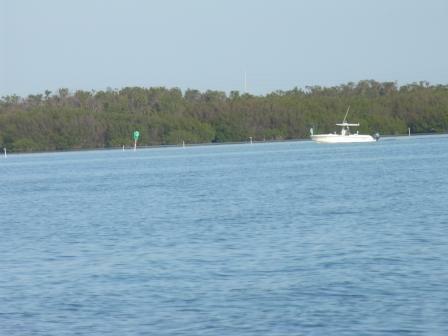 Pay out more anchor rode and take in springline as needed to position your vessel bow to the waves. Try it next time you're out at anchor so you can get the feel of moving the boat where you want it by either letting the anchor rode out more or taking up some of the slack and bringing it back in. It looks like it wouldn't work, but it surely does. You are in actuality, moving the boat's back end [stern] to position the bow. I guarantee, once you've used it to stop rolling while anchored, you'll thank me for this sweet little tip. No, it's a FLYING DINGHY!! 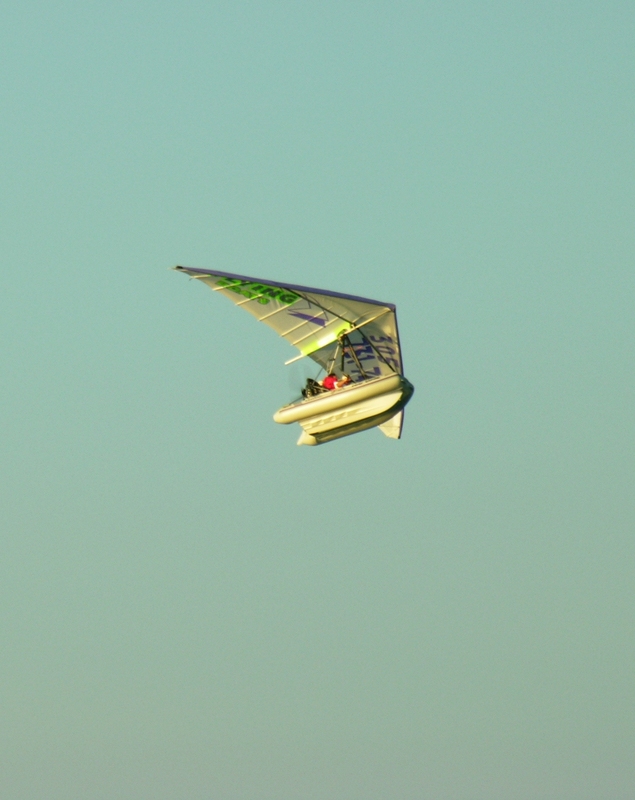 Yep, it's true... you're looking at a flying dinghy. 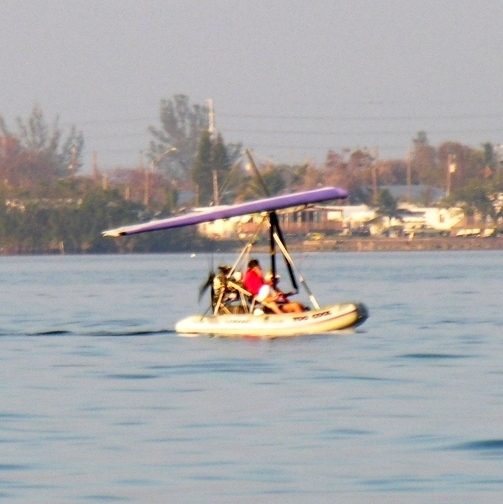 That little boat that allows us to motor in to provision or go into a Harbor for whatever reason, can also FLY! Just like an ultra-light except it's a dinghy. Wow! 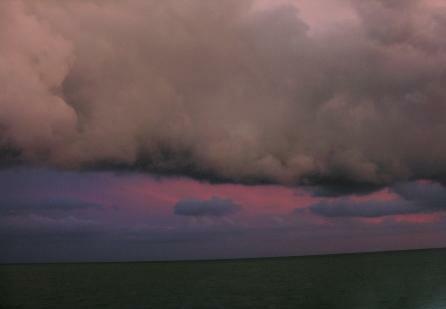 This one flew all around us while we were anchored in Vaca Key Bight. He then landed and took off again. Amazing! Never thought he could get that thing back up into the sky. Bill and I stood there in the cockpit with our mouths hanging open... glad no flies were around! Gulp! 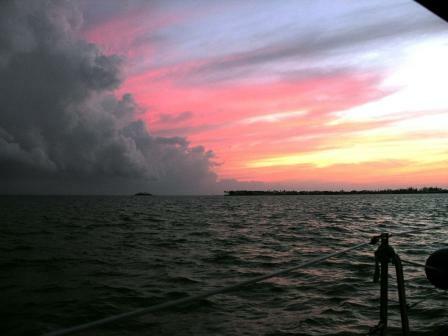 September Sea when out at anchor at Vaca Key Bight. Everything is in order and ready for sailing! Yup, sho' is! I got the wicker "ditty box" from a shop here in Marathon and I'm totally in love with it. Inside the box are blankets, shoes, pillows, and all kinds of things we couldn't seem to find just the right place for easy access... Oh yeah! This Ditty Box is worth its weight in gold. It also doubles as a coffee table. We put our teak table top on it (which normally is attached to the outside of our refrigerator, it's our former cockpit table that we deemed to small). This ditty box is undeniably indispensable to us. It fits our lifestyle perfectly and makes our salon truly a comfort zone. Our dining table, which doubles as my work desk (keyboard holder) fits forward of the ditty box running amidships (across the boat, from side to side [port to starboard]). Four people can dine comfortably with one sitting on the ditty box. SOLD! In the picture above you can see the ditty box is moved all the way forward and is situated fore and aft, in a vertical position. This makes a perfect chaise lounge. 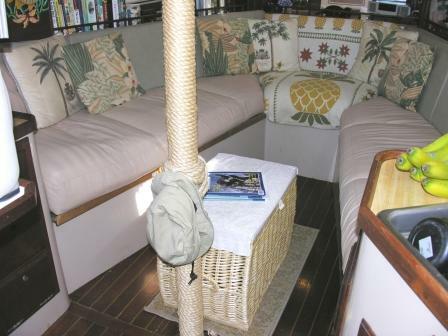 The top of the ditty box has a padded seat with a very light colored fabric on it, so I've got it covered with a beach towel in the above picture). I'm making an apple pie... sort of. It's New Year's Eve and we have three Granny Smith apples, lots of walnut and date instant oatmeal packets, some raisins... but not a lot of flour and no shortening. I had Bill cut up the apples while I made a pie crust out of flour and Mazola corn oil with a bit of sugar. Makes a great pie crust and easy to do. The idea came from Corrine Kanter's "K.I.S.S. Cookbook" which really has some nice easy what-do-I-have-on-board-so-I-can-cook recipes in it. She adds a bit of milk to her crust, I added half-and-half and more sugar to the recipe. I then took the apples, some sugar, cinnamon, nutmeg, flour and two packets of Quaker date & walnut instant oatmeal, added some raisins and filled the crust. Made another top crust and blanketed it over the whole thing (which was piled high). It came out fantastic! The crust was awesome! Flaky, melt-in-your-mouth. I baked it for 35 minutes at about 350 degrees. Our alcohol stove can get very hot and it's not so easy to regulate the temperature exactly right, so often the heat is higher than one thinks... but I usually turn the heat down a bit after the oven really gets hot. Most apple pies won't cook that fast, but mine sure did. It wasn't that big, made in a brownie pan. But man was it delicious. Bill loved it. September Sea loves her Sunsets. 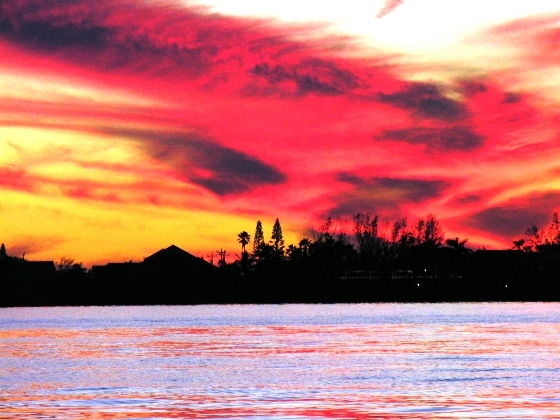 Red Sky at Night, Sailor's Delight... Woooo Hooooo!